Evergreen is a Bi-weekly collection of links to the best learning resources in business, collected by a group of managers, founders, and investors. We contribute resources about one topic, which are synthesized and shared in this Bi-weekly Edition. The aim is to learn more efficiently through increased context and focus. Join here to receive the next Edition of Evergreen Business Weekly. In researching scale, I’ve seen it referred to as a beast, chaos, and a black art. Quickly scaling is the ultimate test for managers and company builders: In fast-moving companies with high stakes, can you operate effectively enough to build a strong, enduring organization? This collection of thoughts about the challenges of scaling will help you see scale in different ways, and think of new ways to combat it while building a successful company. The logical first interaction with scale is anticipation. It seems to loom so close, that preparations should be made for it’s arrival immediately! This is a trap that leads to a lot of stupid behavior that could be avoided through some critical thought. Ben Horowitz has a short and beautiful post about The Scale Anticipation Fallacy. His particular application is about staffing — avoiding the assumption that a team member ‘won’t scale’ and feeling the need to replace them before they actually fail to perform. I’ve seen this assumption in action, and Horowitz is right to fight it — this scale anticipation fallacy is an easy trap to succumb to, and the effects are vicious. However, I think the Scale Anticipation Fallacy is under-appreciated in broader applications. It’s not just something that happens with people. The problem of anticipatory judgement also affects processes, marketing tactics, and product decisions. The antidote is simple: Do not try to predict the distant future. In environments of uncertainty, the best course of action is to make decisions that optimize for the near and known future. Employ people, tactics, and processes that solve the problems in front of you immediately. Avoid the trap of solving for problems that aren’t staring you in the face yet. Work on surviving long enough to confront those problems later on. One of the many interesting pieces about scale suggested by Gergely Hodicska was written by a veteran Facebook Engineer, Kent Beck. This post jumped out because while it was clearly about managing scale, it completely reframed the problem: Scale isn’t the problem — scale is the force that turns failures of complexity into problems. As a system scales, whether it is a manufacturing plant or a service like ours, the enemy is complexity. If you don’t confront complexity in some way, it will eat you. However, complexity isn’t a blob monster, it has four distinct heads. States — When there are many elements in the system and each can be in one of a large number of states, then figuring out what is going on and what you should do about it grows impossible. Interdependencies — When each element in the system can affect each other element in unpredictable ways, it’s easy to induce harmonics and other non-linear responses, driving the system out of control. Uncertainty — When outside stresses on the system are unpredictable, the system never settles down to an equilibrium. Irreversibility — When the effects of decisions can’t be predicted and they can’t be easily undone, decisions grow prohibitively expensive. He goes on to show examples of how different companies (Ford Motor Company and Facebook) solved complexity by isolating different variables of complexity. Firmly addressing any one of these variables will provide a solution to problems caused by complexity stressed with increasing scale. Do you ever wonder why scaling up an organization causes such trouble? There are a few mathematical formulas that explain this clearly, and model the challenges that are to be overcome in order to scale successfully. I’m very grateful for this post by Adrian Colyer, suggested by Gergely Hodicska. 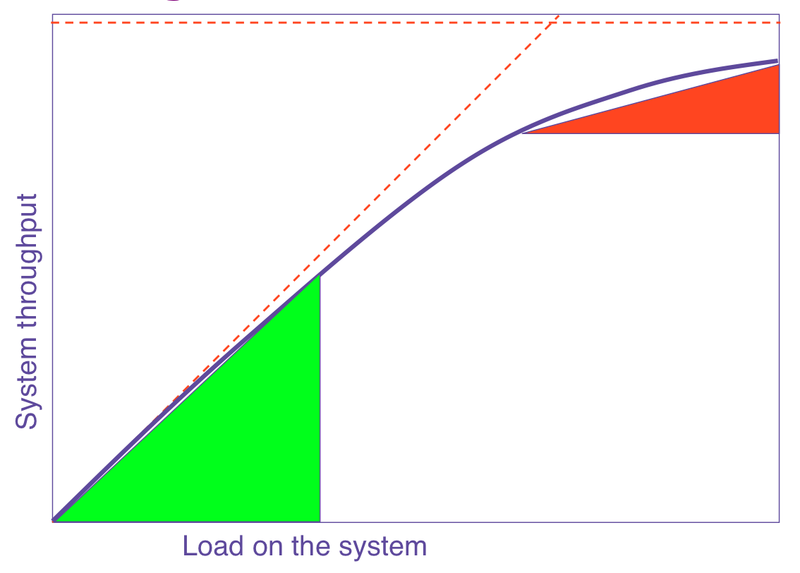 In this post, Applying The Universal Scalability Law to Organizations, Colyer unpacks a few formulas in simple terms that show us why scaling causes slowdowns. The more operational decisions you need to be involved in, and the deeper you get involved, the more tasks you handle yourself, the higher your α coefficient and the more you limit the overall scalability of your organization. So the first lesson is that it’s really important you learn to delegate effectively and to choose carefully the things that you do get involved in. If you want high output, remove yourself from decisions. 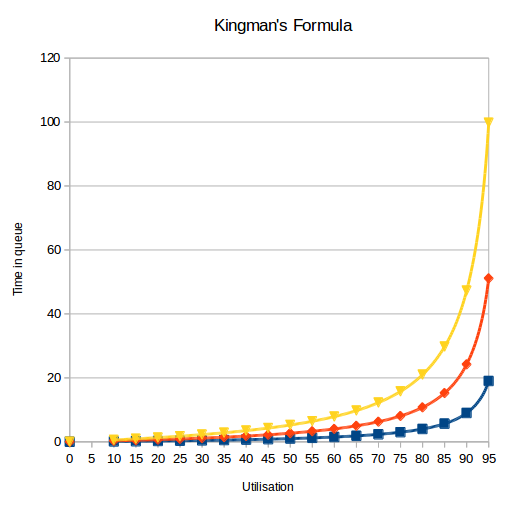 Another formula that was particularly interesting to me was the Kingman’s Formula. It answers the question of utilization of management time: Do you think that time utilization closer to 100% (Managers working super hard, all the time), creates faster output? Firstly observe that as you approach 100% utilization, the wait times go up dramatically. Secondly, the three curves I have plotted show the effect of different levels of variability — the yellow curve having the most variability. In my experience there is very high variability in the things you get asked to do / choose to do as part of the senior leadership team of an organization. So the ‘Kingman effect’ is closer to the yellow curve than the blue one. The fourth key lesson is that working at or close to 100% utilization will slow to a crawl everything that depends on you. What am I suggesting you do then? You need to climb back down the utilization curve, to the point where the delays you’re introducing into the organization are acceptable. I would recommend setting a WIP (Works-in-progress) limit that gives you a utilization somewhere in the 60–80% range. This short paper is SUPER fascinating. It’s a great read for all managers and employees — this wisdom is broadly applicable. You’ll be very glad you spent 5 minutes to truly understand the basic math behind your scaling problems. By far the most comprehensive resource on this list is Scaling Up Excellence, suggested by Mahesh Bhatia. It was written by two Stanford professors who have studied scaling organizations for the past ~10 years. This book is a deep, thorough look at what it takes to scale organization — and to create an environment where pockets of excellence are emulated throughout. No matter what kind of organization you’re a part of, this book will have relevant advice. Scaling Up Excellence has a wealth of information in it. 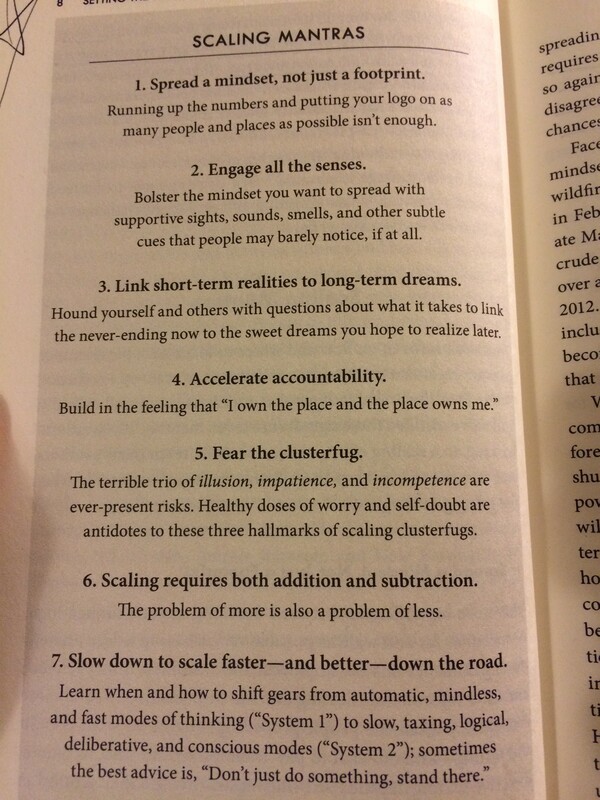 The page most dense with wisdom is below — the Scaling Mantras. If you’re in the throes of a battle with the chaos of scaling an organization, picking up Scaling Up Excellence is likely to be a very good investment. If your company is growing fast and you’re worried about scaling well, that means you’re likely to have customers waiting on you — Demand > Supply. So the faster you can deliver product successfully to customers, the faster you will grow! There is always some constraint on throughput (delivery of goods to customers), and that most pressing constraint is your bottleneck. Improve the efficiency of your bottleneck, and you improve the throughput of your entire company. This lesson comes from The Goal — one of the most famous business books of all time. Almost every MBA I know had it as assigned reading. It’s a novel, the story of a man tasks with an impossible turnaround of an unproductive factory. By managing bottlenecks effectively, he manages to create an efficient process and a very profitable plant. To manage scale, you must learn to manage the most pressing constraint on growth — there’s no better way to learn that skill than reading The Goal. The Goal is on a short list of books that I reread every few years, because I get new ideas and inspiration every time I do. The framework of identifying and managing bottlenecks is a great way to look at the world, and you’ll start seeing all kinds of opportunities for improvement. Scaling a company is a necessary evil in Ben Horowitz’ view. Fortunate though you are to be in a company that is growing and expanding, it means that everything is about to get harder. He wrote a great post about what must change to keep the organization from breaking down during growth. As organizations grow, they have to adapt new structures that manage that increased scale. As Horowitz outlines in this post, some of those new structures are Specialization, Process and a new Organizational Design. Also, as we noted in the Scale Anticipation Fallacy, you can do harm by adapting to scale before it is forced on you — here he notes that there are also dangers to waiting too long. Different sizes of company impose different requirements on the company’s architecture. If you address those requirements too early, your company will seem heavy and sluggish. If you address those requirements too late, your company may melt down under the pressure. Be mindful of your company’s true growth rate as you add architectural components. It’s good to anticipate growth, but it’s bad to over-anticipate growth. The greatest danger here is probably over-optimism. It seems much more likely to err on the side of over-preparation than to refuse to adapt when growth is causing fires to erupt throughout the organization. Be brutally honest with yourself, and don’t let the hope for growth entice you into premature adoption of scaling processes. Massive appreciation for who suggested pieces of content (or wrote something new) for this Edition of Evergreen: Gergely Hodicska, Aaron Wolfson, Roger L. Cauvin, Preet Anand, Vinish Garg, Mahesh Bhatia and Edson Marqueto Rigonatti.